Ocean circulation plays a critical role in the Earth’s climate system through the storage and transfer of heat and carbon dioxide. The North Atlantic and Southern Ocean are of particular interest because these are regions where deep-water components of global circulation develop. Overall patterns and functioning of modern oceanic circulation is relatively well understood, but significant uncertainty remains about circulation in the geologic past and during different climate regimes. Dr. Romans uses the deep-sea sedimentary record to reconstruct past ocean circulation and its relationship to past climatic and tectonic conditions. He integrates information from a broad range of spatial and temporal scales, from seismic-reflection data that reveals regional sedimentation patterns to high-resolution records based on quantitative grain-size analysis from cores. 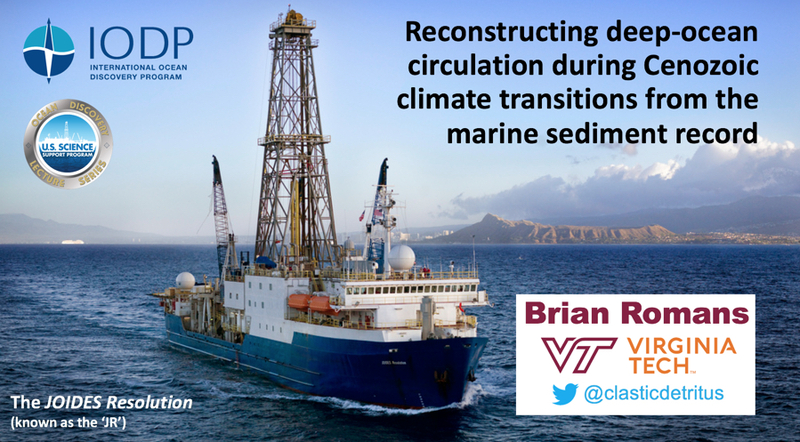 Dr. Romans will present research from the North Atlantic Ocean (Expedition 342, Newfoundland Drifts) that shows how vast deep-sea “drift” deposits relate to the onset of and changes in ocean circulation in the Eocene through Miocene. In addition to his work on the North Atlantic, Dr. Romans will also present preliminary findings from new drilling (January-February 2018) in the Ross Sea (Expedition 374, West Antarctic Ice Sheet History), which aims to study interactions of Southern Ocean circulation and Antarctic ice sheet dynamics during significant climate events of the Miocene and Pliocene.